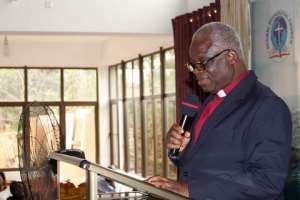 The Moderator of the Global Evangelical Church, Right Reverend Dr. Setorwu Kwadzo Ofori, has appealed to Ghanaians, especially the youth, to debunk the notion that they could only be successful when they travel abroad. He said it was regrettable to see young graduates leaving the shores of Ghana in search of so called greener pastures while such rich human resources could be garnered to transform the nation. 'You can make it right here in Ghana because God has blessed this nation with all the resources that we need to make it in life. All we need to do is to change our work attitudes and also be responsible in the use of our environment and other resources,' he said. Rev. Dr. Ofori was preaching the sermon to mark this year's Bible Week celebration at the Legon Interdenominational Church in Accra. The sermon was on the theme: 'The Bible and Our Civic Responsibilities'. The Moderator said one could be responsible in the payment of the right taxes, avoid corruption in all its forms, report to and close from work on time and the prompt payment of television licenses among other civil tasks. He said in exercising our civic responsibilities we must shun laziness, idleness, be vigilant, use our talents well for community/nation building and also strive for excellence. The Moderator said the indiscriminate use of the country's natural resources as well as public properties left much to be desired and called for an immediate turn-about in order not to be judged by posterity. Rt. Rev. Dr. Ofori, therefore, called on every citizen to emulate the example of the Lord Jesus by rebuking societal wrongdoings in love and that it was important to correct one another anytime one went wrong. 'For instance, if someone throws pure water sachet on the floor, or even throws rubbish into gutters during rainfall, it is our civic responsibility to correct such a person,' he said. Rev. Dr. Erasmus Odonkor, the Secretary General of the Bible Society of Ghana, in a speech read on his behalf, said the Bible Society is a non-denominational and non-governmental Christian organisation and the largest bible distributor in Ghana. The purpose of the Society was to translate, publish and distribute bibles at affordable prices and promote its use to transform lives, he said. Rev. Dr. Odonkor said the Vision of the Bible Society was to reach out to every home in Ghana with the Word of God in a language they understand. He, therefore, appealed to individuals, corporate institutions and philanthropists to support the Society by becoming lifetime members through their subscriptions and donations to enable them to accomplish their goals.